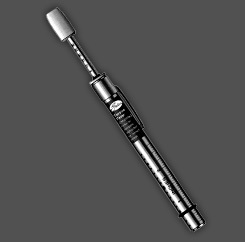 Now you can get consistent, accurate tension readings without the stress, thanks to the Gates Sonic Tension Meter. 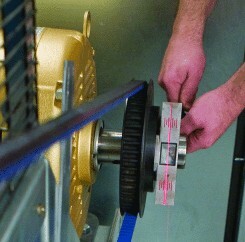 It measures belt tension by analyzing the harmonic characteristics of a vibrating belt. Consistent, accurate tension readings every time!Now you can get consistent, accurate tension readings without the stress, thanks to the Gates Sonic Tension Meter. 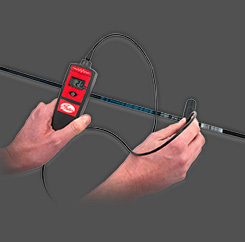 It measures belt tension by analyzing the harmonic characteristics of a vibrating belt.Simply strum the belt like a guitar string and the meter takes care of the rest.The force and deflection method used to be the only reliable way to test belt tension. Of course, it required a spring tester, plenty of muscle, a piece of string and unfortunately, at least three hands. Belts, like strings, vibrate at a particular natural frequency based on mass and span length. Gates unique Sonic Tension Meter simply converts this frequency into a measurement of tension. Here’s how it works: First, enter belt mass constant, belt width and span length into meter using built-in keypad. Next, hold meter sensor to belt span, then lightly strum belt to make it vibrate. Press “measure” button to obtain reading and the meter quickly converts vibrations into belt tension. Readings are displayed on a liquid-crystal screen. 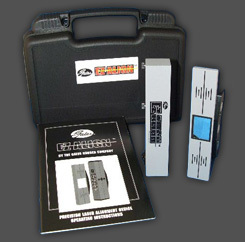 * Belt mass constants are listed on a data card that comes with the Sonic Tension Meter. Next, hold meter sensor to belt span, then lightly strum belt to make it vibrate. 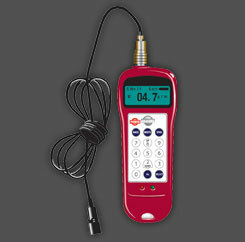 Press “measure” button to obtain reading and the meter quickly converts vibrations into belt tension.